While in early adulthood, he migrated to artistically progressive Florence, on 28 November 1445 he was described as a pupil of the Carmelite friar Fra Filippo Lippi, and he refined his skills in painting while in his workshop. By 1451 he was active in his home town of Urbino (centre of the duchy of Urbino, a Renaissance papal state ruled by the Montefeltro family during the fifteenth century) when he received payments on behalf of the syndics of S Domenico for the doorway and glazed terracotta lunette commissioned from Maso di Bartolommeo and Luca della Robbia in Florence. He was absolved from painting an altarpiece in 1456. From 1461 he was parish priest at San Cassiano di Cavallino, near Urbino, but he appears to have been active in Urbino, where in 1467 he received payments for an altarpiece of the Birth of the Virgin for S Maria della Bella. 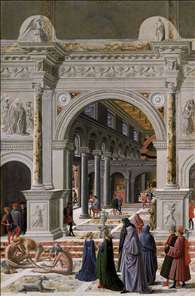 This was his most famous work, which Vasari said influenced Bramante. The picture was confiscated by Cardinal Antonio Barberini in 1631 and has been identified with two panels from his collection (New York, Metropolitan Museum of Art and Boston, Museum of Fine Arts). Carnevale is listed in a later memoria among the engineers and architects of Federigo II da Montefeltro, Duke of Urbino. See more details about "Presentation of the Virgin in the Temple"